Rouba, N., Sadoun, T., Boutagrabet, N., Kerrouche, D., Zadi, S., Mimi, N. (2015). Thermo-Oxidation and Biodegradation Study of Low-Density Polyethylene /Starch Films by IR Spectroscopy. Iranian Journal of Chemistry and Chemical Engineering (IJCCE), 34(4), 69-78. Nabila Rouba; Tahar Sadoun; Naima Boutagrabet; Djamila Kerrouche; Salem Zadi; Nassiba Mimi. "Thermo-Oxidation and Biodegradation Study of Low-Density Polyethylene /Starch Films by IR Spectroscopy". Iranian Journal of Chemistry and Chemical Engineering (IJCCE), 34, 4, 2015, 69-78. Rouba, N., Sadoun, T., Boutagrabet, N., Kerrouche, D., Zadi, S., Mimi, N. (2015). 'Thermo-Oxidation and Biodegradation Study of Low-Density Polyethylene /Starch Films by IR Spectroscopy', Iranian Journal of Chemistry and Chemical Engineering (IJCCE), 34(4), pp. 69-78. Rouba, N., Sadoun, T., Boutagrabet, N., Kerrouche, D., Zadi, S., Mimi, N. Thermo-Oxidation and Biodegradation Study of Low-Density Polyethylene /Starch Films by IR Spectroscopy. 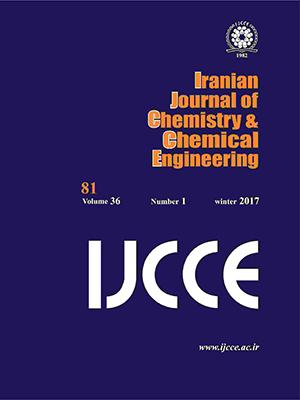 Iranian Journal of Chemistry and Chemical Engineering (IJCCE), 2015; 34(4): 69-78. This article reports a study of the thermo-oxidation and biodegradation in the soil of low-density polyethylene/starch films (LDPE/starch) by infrared spectroscopy: Films of LDPE/Starch blends of different composition (starch content range from 0 to 15% w/w),were prepared and exposed to thermo-oxidation at different temperatures at 80, 90 and 100°C,and buried in the soil of public dump during 300 days. The oxidation, for films subjected to thermal oxidation, was revealed by the appearance of absorption bands of carbonyl groups centered at 1715 cm-1. After the induction period, which varies from 12 to 14 days according to the concentration of starch incorporated in the films, the indication of carbonyl croup increases with time and temperature of exposition. During the first 30 days, the rate of oxidization is the weaker, the larger percentage of starch in the film of LDPE. The biodegradation of films buried in the soil for 300 days, was followed by infrared spectroscopy. The carbonyl index calculated at 1715 cm-1 and at 1744 cm-1 showed the oxidation of films LDPE/starch. This index increases with time of burial and starch percentage incorporated into LDPE films during the first 180 days in soil burial, then decreases. Orhan Y., Buyukgungor H., Enhancement of Biodegradability of Disposable Polyethylene in Controlled Biological Soil, Ineternational Biodetorioration & Biodegradation,45: 49-55 (2000). Jakubowicz I., Evaluation of Degradability of Biodegradable Polyethylene (PE), Polymer Degradation and Stability, 80: 39-43 (2003). Benítez A., Sánchez J.J., Arnal M.L., Müller A.J., Rodríguez O., Morales G., Abiotic Degradation of LDPE and LLDPE Formulated with a Pro-Oxidant Additive, Polymer Degradation and Stability,98: 490-501 (2013). Torabi Angaji M., Hagheeghatpadjooh H.R., Preparation of Biodegradable Low Density Polyethylene by Starch-Urea Composition for Agricultural Applications, Iranian Journal of Chemistry and Chemical Engineering (IJCCE), 23: 7-11 (2004). Arvanitoyannis I., Biliaderis C.G., Ogawa H., Kawasaki N., Biodegradable Films Made from Low-Density Polyethylene (LDPE), Rice Starch and Potato Starch for Food Packaging Applications: Part 1, Carbohydrate Polymers,36: 89-104 (1998). Khabbaz F., Albertsson A-C., Karlsson S., Chemical and Morphological Changes of Environmentally Degradable Polyethylene Films Exposed to Thermo-Oxidation, Polymer Degradation and Stability, 63: 127-138 (1999). Hamid S.H., “Handbook of Polymer Degradation”, Marcel Dekker INC, New York (2000) . Nowak B., Pajak J., Drozd-Bratkowicz M., Rymarz G., Microorganisms Participating in the Biodegradation of Modiﬁed Polyethylene Films in Different Soils under Laboratory Conditions, International Biodeterioration & Biodegradation., 65: 757-767 (2011). Ali R.R., Abdul Rahman W.A.W., Ibrahim N.B, Kasmani R.M., Starch Based Biofilms for Green Packaging, World Academy of Science, Engineering and Technology,70: 531-535 (2012). Chiellini E., Corti A., Swift G., Biodegradation of Thermally Oxidized Fragmented Low-Density Polyethylene, Polymer Degradation and Stability, 81: 341–351 (2003). Griffin G.J.L., Degradable Plastic Films, In: "Proceedings of Symposium in Degradable Plastics", Society of Plastic Industry, Washington. (1987). Albertsson A-C., GriffinG.J.L., Karlsson S., Nishimoto K., Watanabe Y., Spectroscopic and Mechanical Changes in Irradiated Starch-Filled LDPE, Polymer Degradation and Stability, 45: 173-178 (1994). Chiellini E., Solaro R., Corti A., Picci G., Leporini C., Pera A., Val-lini G., Donaggio P., Degradation of Starch-Flled Polyethylene Films in a Composting Environment, Chemical Industry., 8: 656-663 (1991). Mumtaz T., Khan M.R., Hassan M-R., Study of Environmental Biodegradation of LDPE Films in Soil using Optical and Scanning Electron Microscopy, Micron,41: 430-438 (2010). Bikiaris D., Prinos J., Panayiotou C., Effect of Methyl Methacrylate-Butadiene-Styrene Copolymer on the Thermo-oxidation and Biodegradation of LDPE/Plasticized Starch Blends, Polymer Degradation and Stability, 58: 215-228 (1997). Sudhakar M., DobleM., MurthyP.S., VenkatesanR., Marine Microbe-Mediated Biodegradation of Low- and High-Density Polyethylenes, Internationa. Biodeterioration & Biodegradation, 61: 203-213 (2008). Bikiaris D., Prinos J., Panayiotou C., Effect of EAA and Starch on the Thermo-Oxidative Degradation of LDPE, Polymer Degradation and Stability, 56: 1-9 (1997). Willett J.L., Mechanical Properties of LDPE/Granular Starch Composites, Journal of Applied Polymer Science, 54: 1685-1695, (1994). AbdEl-Rehim H.A., Hegazy E-S., Ali A.M., Rabie A.M., Synergistic Effect of Combining UV-Sunlight-Soilburial Treatment on the Biodegradation Rate of LDPE/Starch Blends, Journal of Photochemistry and Photobiology A:Chemisry, 163: 547–556 (2004). Albertsson A-C, Andersson S.O., Karlsson S., The Mechanism of Biodegradation of Polyethylene, Polymer Degradation and Stability, 18: 73-87 (1987). Pedroso A.G., Rosa D.S., Mechanical, Thermal and Morphological Characterization of Recycled LDPE/Corn Starch Blends, Carbohydrate Polymers, 59: 1-9 (2005). Erlandsson B., Karlsson S., Albertsson A-C, The Mode of Action of Corn Starch and A Pro-Oxidant System in LDPE: Influence of Thermo-Oxidation and UV-Irradiation on the Molecular Weight Changes, Polymer Degradation and Stability, 55: 237-245 (1997). Yu F., Prashantha K., Soulestin J., Lacrampe M-F., Krawczak P., Plasticized-Starch/Poly(ethylene oxide) Blends Prepared by Extrusion, Carbohydrate Polymers, 91: 253–261 (2013). Bonhomme B., Cuer A., Delort A-M., Lemaire J., Sancelme M., Scott G., Environmental Biodegradation of Polyethylene, Polymer Degradation and Stability, 81: 441-452 (2003). Marquelin K., Kirshner C., Choo-Smith L.P., Van der Braak N., Endtz H.P., Naumann D., Puppels G.J., Identification of Medically Relevant Microorganisms by Vibrational Spectroscopy, Journal of Microbiological Methods, 51: 255-271 (2002). Linos A., Berekaa M.M., Reichelt R., Keller U., Scmitt J., Flemming H., Biodegradation of cis-1,4-Polyisoprene Rubbers by Distinct Actinomycetes: Microbial Strategies and Detailed Surface Analysis, Applied and Environmental Microbiology, 66: 1639-1645 (2000). Yu J.G., Yang J.W., Liu B.X. Ma X.F, Preparation and Characterization of Glycerol Plasticized-Pea Starch/ZnO–Carboxymethylcellulose Sodium Nanocom-Posites, Bioresource Technology, 100: 2832–2841 (2009). Balasubramaniam S., Maruthamuthu S., Khare A., Palanisamy N., Muralidharan V.S., Ragunathan R., Influence of Thermal Oxidation on Surface and Thermo-Mechanical Properties of Polyethylene, Journal Polymer Research, 18: 2175-2184 (2011). Chiellini E., Corti A., D’Antone S., Baciu R., Oxo-Biodegradable Carbon Backbone Polymers- Oxidative Degradation of Polyethylene under Accelerated Test Conditions, Polymer Degradation and Stability, 91: 2739-2747 (2006). Mailhot B., Morlat B., Gardette J-L., Boucard S., Duchet J., Gerard J-F., Photodegradation of Polypropylene Nanocomposites, Polymer Degradation and Stability, 82: 163-167 (2003). Ramos Filho F G., Mélo T.J.A., Rabello M.S., Silva S.M.L., Thermal Stability of Nanocomposites Based on Polypropylene and Bentonite, Polymer Degradation and Stability, 89: 383-392 (2005). Carlsson J.D., Garton A., Wiles D.M., Initiation of Polypropylene Photooxidation. 2. Potential Processes and Their Relevance to Stability, Macromolecules, 9: 695-701 (1976). Schlegel H.G., "Allgemeine Mikrobiologie", 4 Auflage, Georg, Thieme Verlag, Stuttgart (1976). Hasan F., Shah A.A., Hameed A., Ahmed S., Synergistic Effect of Photo and Chemical Treatment on the Rate of Biodegradation of Low Density Polyethylene by Fusarium sp. AF4, Journal of Applied Polymer Science, 105: 1466–1470 (2007). Zahra S., Seyed Abbas S., Mahsa M-T, Mohsen N., Biodegradation of L-Density Polyethylene (LDPE) by Isolated Fungi in Solid Wastemedium, Waste Management, 30: 396- 401 (2010). Weiland M., Daro A, David C., Biodegradation of Thermally Oxidized Polyethylene, Polymer Degradation and Stability, 48: 275-289 (1995). Vasile C., “Handbook of Polyolefins Synthesis and properties”, Marcel Dekker INC, New York (1993).